Water is what children and teens drink the most, according to a new national study. But it is still less than half of all beverages consumed after working out, at meals and during the day. The National Health and Nutrition Examination Survey shows water accounted for nearly 44 percent of total beverages between 2013 and 2016 among United States youth ages 2 to 19. Aside from water, milk came in second, soft drinks were a close third at 20 percent, and fruit juice was less than half that. National soda consumption is on par with some parts of Wisconsin, like Chippewa County, where they are part of a national health campaign called Kick the Can. It’s designed to curb consumption of sugar-sweetened drinks. One-in-5 high schoolers drink one or more sodas a day, according to the not-yet-released Chippewa County’s 2017 Youth Risk Behavior Survey. And half of students are drinking a glass of milk every day, said Judy Fedie, a registered dietitian and nutrition division manager with the Chippewa County Department of Public Health. 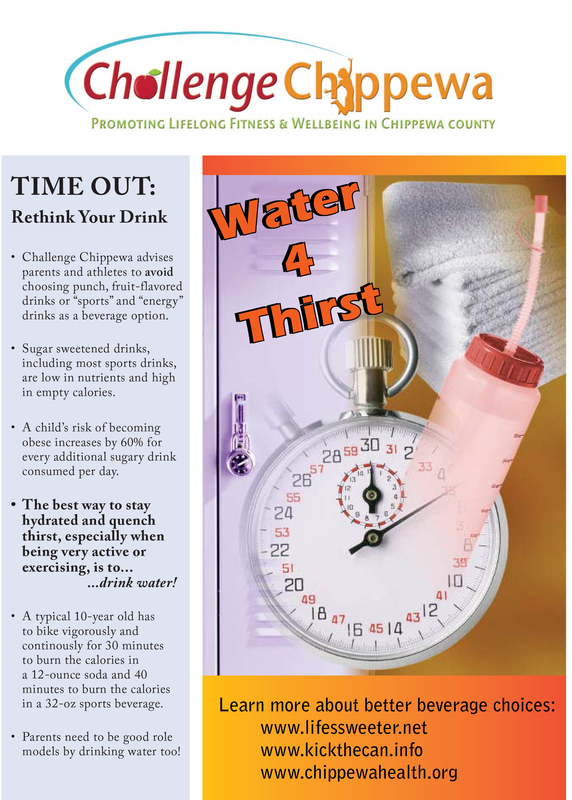 Chippewa County is encouraging youth to drink less soda and other sugar-sweetened beverages by raising community awareness through sports posters which suggest athletes should avoid most sports drinks and encourage parents to be good role models by drinking water. Health officials there are also trying to educate parents about the calories in soda as a contributing factor in childhood obesity. If a child drinks a 20-ounce soda every day, the campaign says, they are getting 52 pounds of sugar in a year. "So we looked at what’s out there already, we didn’t want to reinvent the wheel. We borrowed on what the state of New York has done, for example," Fedie said. "They had a Pouring on the Pounds campaign. And we prepared some posters and did some community awareness around the hazards of drinking sugar-sweetened beverages." The county has not done a formal evaluation of the health campaign to determine its effectiveness, but according to anecdotal accounts, the message may be getting through to people. "We’ve had some sports coaches report to us that they have stopped serving root beer as a reward for a good practice. We’ve had faith-based groups say, 'We don’t serve soda at our youth gatherings anymore. We’re just offering water,'" Fedie said. Nationally, girls drink more water than boys and children drink more water as they get older. But they also consume more soda. The author of the national report said their definition of soft drinks was expansive. "Soft drinks included both diet and non-diet forms and also included fruit drinks. These are beverages that are not 100 percent juice but do have some fruit juice in them," said Kirsten Herrick, a nutritional epidemiologist with the National Center for Health Statistics. Youth are drinking less soda than they did in the past, according to a previous National Health and Nutrition Examination Survey which showed two thirds of children and teens were drinking at least one sugar-sweetened beverage daily. "One of the things that we know is that if people choose the healthy choice, the industry will tend to go that way and produce it. They want to make what people are going to purchase and buy," said Chippewa County’s Fedie. She notes there are smaller 8-ounce cans of soda on store shelves along with bottled water.